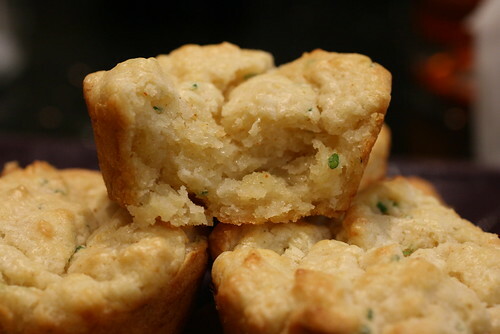 We’ve been to BLT Fish twice and both times, we had these amazing Cheddar & Chive Biscuits. They come out warm with maple syrup butter, and a cute little card with the recipe on it. Both times, I have somehow misplaced the recipe card (it’s very teeny) but luckily Gothamist posted the recipe. 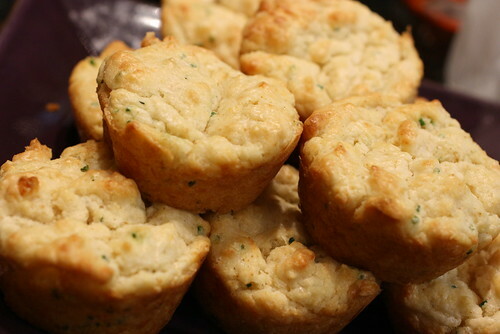 It’s a really easy recipe, done in a stand mixer, scooped into muffin tins, and baked. The batter actually looked like tuna fish salad to me. The result is delicious, BUT, it’s not the real recipe. It was probably simplified for home use. I’m pretty sure the one they serve in the restaurant is not baked in a muffin tin. Also, this recipe (home-use) yields a velvety soft inside, while the one in the restaurant has a bit more body and has distinct layers. If it sounds like I’m complaining, I’m not. This is still a fantastic recipe. The flavor is all there, creamy and cheesy, with the aroma of fresh biscuit dough, a little kick, and really well seasoned. Would I use this recipe again? Hell Yes! Will I play around with it too to get that restaurant quality texture? You betcha! posted by jessica	at 05:07 PM	Filed under Un-Recipes. You can follow any responses to this entry through the RSS 2.0 feed. Both comments and pings are currently closed. This is great! I found some fresh and perfect chives in my herb garden outside, buried under a few feet of snow! I’m sure these would be awesome with regular butter, but the BLT maple syrup butter sounds very comforting. Yum, those look so delicious. I guess with carbs and cheese you really can’t go wrong. I have a bad feeling that I could probably take on about 4-5 of these in one sitting. Dr. Food, they’re rich enough to eat plain too. Toxobread, I always try to refrain from reading food blogs when I’m very hungry. Pearl, they are quite delicious! These biscuits look so amazing! hellooooo cheese biscuits! 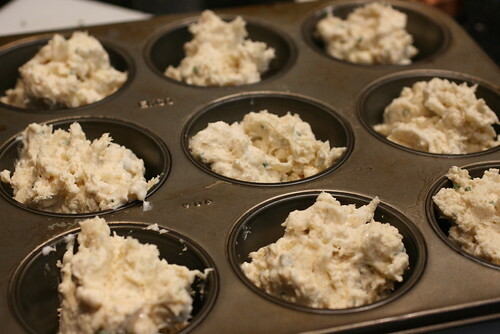 i rarely use my muffin tins for anything other than sweet stuff, but these are irresistible. I just made some cheesy biscuits for Thanksgiving too. I love the addition of chives though. I’ll definitely keep those in mind for next time! Gaga, these are the bomb! I agree that it’s not the same recipe. The proportions of heavy cream to flour is way higher than all my other biscuit recipes. I tried it once and felt it was definitely greasier than the original and lacked the layers that I love in biscuits. BLT Fish most likely uses some round cutter to get the perfect little biscuits.